uplifting, encouraging, and inspiring young men of color to secure their future. Crutcho Elementary school held its annual Valentine's Tie Day and it was our absolute pleasure to attend and be involved. We have to inspire and encourage young men so that they can overcome any obstacles they face in life. It's bigger than teaching them how to tie a tie. Being a positive influence on future generations is more important than you may notice. However, that's because you're thinking on the surface. Yes, the targetted age to be the most influential is in your 20s. Yes, your 20s are scripted to be your 'selfish years,' but instead of being the "basic" 20-something, step outside the box and use one of your biggest strengths: your influence. In your 20s, you are still considered cool enough to connect with the youth but old enough to know a little something about something. You're crossing the path, or just crossed the path that teenagers currently agonize over. Life after high school to be specific. The youth are the future as are the millennials. Let's do our part to make this a better world for generations to come. Supporting young men and creativity. We believe that being a Gentleman has become a dying art. We are here to uplift, encourage, and inspire young men to become their best self. Its easier to believe in yourself when you're surrounded by positive reinforcement and thats what we're here to provide. Some say chivalry is dead, which is a bogus statement. Although it's not a widespread trend or lifestyle anymore, there are plenty of true gentlemen in our society. However, there's room for improvement. With independent women being more appreciated by the day, chivalry has become less common. It's not necessarily because men don't want to cater to women, but many are discouraged because some women resist it all. The story should be about how true gentlemen aren't allowed to be their true selves without denial or interference. Reinventing the modern gentleman needs to be a team effort. We need our women to continue being phenomenal, independent women while still allowing men to be themselves. we believe that a gentleman should be a well rounded individual with something to give back to the world. One of our goals is to encourage and inspire young men with more to offer the world. These young men have the creative mind and spirit to do great things, they just need support. Who likes a man that is exclusive to doing one thing or who isn't multi-faceted? The kid that was good at basketball in high school but didn't have any substance behind it has fallen behind the eight-ball. Now the artistic kid that liked classical music and reading books is the real baller. Gentlemen, make sure you are well-rounded. Success typically isn't about who is the best at a singular thing, it's who's the most well-rounded. You'll have multiple opportunities on multiple different platforms if so. Don't limit yourself and be a true renaissance man. In a society where the black man isn't heavily sought-after by the masses, a movement called '#BlackBoyJoy' has caught fire. It is essential that black men portray themselves as joyful and driven while showing how proud they are in their own skin. Too often are black men portrayed as hardened creatures, instead of normal individuals. The feeling that black men don't have to conform to the stigmas and stereotypes that people place on them is what fuels the movement. Be comfortable with your true self and stop caring what society tries to make you out to be. The black man is misunderstood, but let them wonder while you continue to spread the joy. Something that has and will continue to elevate the black man is a brotherhood. There's a difference between having friends and having one big brotherhood. Everyone isn't the same. We are all different, that's fine, but there should always be that respect and understanding that is a brotherhood. It doesn't need to be all black or all white, but find a group of guys that possess the same interest as you and help each other grow individually. This will play an active role in the elevation of today's society. The Art of Romance was our first ever event, it was a live music and art show featuring some of the best local talent in Oklahoma City. The proceeds of the event went to support our scholarship, The Man of The Year Award. Every Grand Gentlemen event will be held to raise money or awareness to a cause we wholeheartedly believe in. 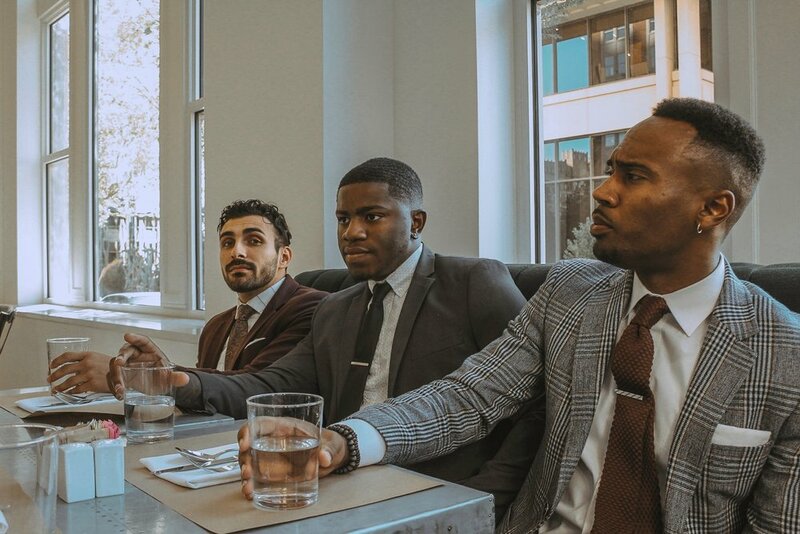 Because we’re passionate about enriching the lives of our peers, every event we host will promote the Gentleman’s lifestyle, culture, or fashion in some way by featuring local artist, performers, musicians, designers, and business’. Especially those of color. Our live musical performances included Mansions, Taylor Leigh, Sara Byrd, and Sid Carter and his band High Sobriety. Our Poets included Tavie and Mac Woods of Poetic City, and well as one of last years winner of our scholarship Day’ Quann Erivn of Poetry n’ Chill. WATCH- Got Any Spare Change written and directed by DeQuan Cooper! Along with "Attention" By Gabrielle B. ! After an odd encounter with an all but ordinary beggar on the side of the road, Trevon learns that sometimes... it's better to give than it is to receive in this twisted tale starring Terrell Savala and Korey Eakers, written and directed by DeQuan Cooper Check out our website below for exclusive content and more! We have come to realize, we are STRONGER TOGETHER. If enough young men come together we can create the change we wish to see. Growing up a black man means growing up having to fight. Not physically, but for respect, equal treatment and to deflect all negative stereotypes prematurely placed on us. Individually, we crave change but at the same time in competition with each other and that's what needs to change. It's already hard for black men to get ahead so why would we make it harder by being in competition with ourselves? The common denominator that separates a successful black man and others that fall off the grid is collaboration. Finding like-minded individuals that are about change just like you are. Our Influence Is Our Biggest Strength. Sign up to get the latest Grand Gentlemen updates!.